To those of you who have ever spent time in a high school English class, I’ll lay odds that you can recognize, “Once upon a midnight dreary,” or “Two roads diverged in a yellow wood.” Yes, Poe and Frost, two of America’s most anthologized and over-exemplified poets, are easily recognizable by anyone with even a modicum of exposure to American literature. But what makes it so easy to recognize these guys? Clearly their works are timeless and, as I’ve suggested here, are too often held as exemplars of American poetic traditions. But beyond that, these and so many other poems in the canon are recognizable for HOW they say what they say. Poets like Frost and Poe and Lucille Clifton and Emily Dickinson and even crazy ol’ Billy Collins have successfully cultivated a distinctive voice for themselves, rendering them recognizable enough to any reader even just slightly more advanced than the average poetry consumer. “And?” you may be asking. “So what?” (Which are good things to ask, really, two of the best questions a writer can ask, I tell my students.) What IS the point? The point is this: Developing a solid voice is essential to taking that crucial step from dabbler to writer. But how? What price, “voice”? It isn’t enough for writing profs to say, “Hey, get a voice will ya?” and expect nascent writers to fall into line. Sadly, I think I’m far from qualified or equipped enough to wave the Wand of Panacea over the Intertubes and help those in need—but I am more than willing to share my experience and hope some of you take away something useful from it. 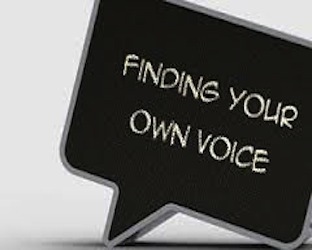 See, in looking to discover whether or not you have your own voice, a distinctive voice, it’s easy to get caught up in looking way too closely at your own work. It’s already so blasted close to you that you have trouble maintaining any objectivity. That’s an issue. To overcome it is to take yet another step on the road to writerhood—setting aside the ego in order to further the work. Once you do set aside that ego, start looking for trends, for kinks in your armor, for crutches and boomerangs. What words are you overusing? What themes keep popping up in your work? Are those themes working for you and staying fresh? If so, you may be grooming what’s sometimes referred to as your “project.” If they’re NOT fresh, then you’ve found a rut, not a project. Recognizing and fostering a voice for oneself is hard. It’s difficult for all the reasons other things are difficult instead of easy: if it were easy everyone would do it and if everyone did it, none of it would be special. Embrace the hard–then remember there are things that can make it easier. Sometimes it’s as easy as tricking the brain, like when I tell my students to critique their own poems by reading them line by line backwards, from end to beginning. Or speed read poems out loud in order to check their readability. Just as there are more advanced methods for proofing a work, there are advanced strategies for developing your voice. All of it, however, comes down to one thing—you being open to learn about your own work and being able to view it as a stranger views it. As for myself, I think it’s gotten out of hand. I’ve been so terrified of becoming “one-note” all my writing life that I think I may have groomed a voice so inherently schizophrenic I call it “Jack,” since it appears to be of all trades and master of none. Maybe that’s what MY voice is though, a cluttered confluence of interests, traditions, and styles. In the end, what’s important to me is that I’m aware of how new work will contribute to my voice as a poet and I work hard to make sure that voice is one I can be proud to share with others. This entry was posted on June 27, 2013, 9:00 am and is filed under Ron, Writer's Signature. You can follow any responses to this entry through RSS 2.0. You can leave a response, or trackback from your own site.